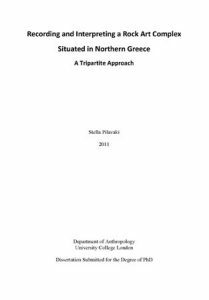 This dissertation adopts an innovative tripartite approach in recording and reaching an adequate understanding of a hitherto untheorised and under-investigated rock art complex situated in Northern Greece. Post-structuralism and phenomenology form the theoretical ground on which this study is founded. It phenomenologically explores a set of experiences not restricted to vision but related to a multi-sensory, bodily engagement with the art and the land in which it exists. It also examines the structuring of the motifs in relation to their location in the landscape in order to identify possible patterns indicative of the social actions that generated them and of which they are the material traces. The parameters of this art are then placed and assessed against what is known about the cultural background of the makers from historical sources. This study demonstrates that the conceptual and the experiential are inextricably linked, and thus structuralism and phenomenology are not mutually exclusive as has been often thought. The third aspect of my approach, namely the use of historical literature, allows assessment of the way that structures of meaning might relate to a specific cultural context. 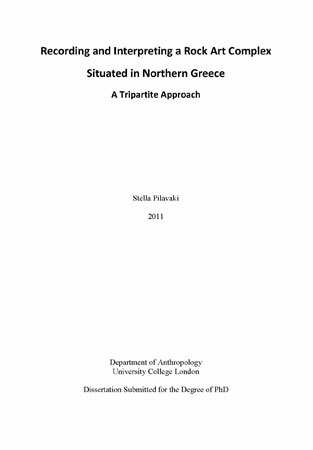 The overall aim of this thesis is to evaluate the role that the decoration of rocks may have played in the social construction of landscapes and the constitution of the social self.